The actress obviously had enough of the ridiculous traffic situation this week. 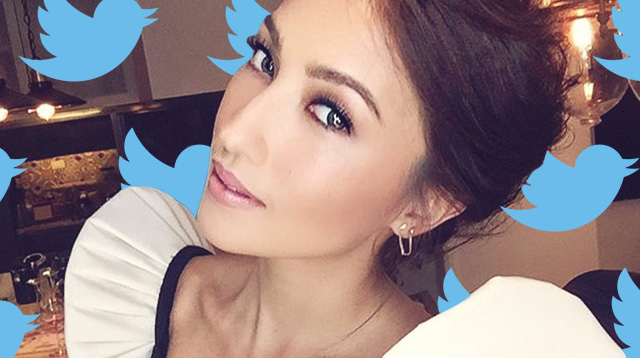 Solenn Heussaff took to Twitter on November 16, Monday, to express just how ridiculous the traffic is in the metro, especially with all the road closures during the Asia-Pacific Economic Cooperation Summit in Manila this week. I wish that during APEC they would show what our country really is like. Instead of hiding things and making going to work impossible. The world's most powerful leaders from Australia, Brunei, Canada, Chile, China, Hong Kong, Indonesia, Japan, Malaysia, Mexico, New Zealand, Papua New Guinea, Peru, Russia, Singapore, South Korea, Taipei, Thailand, the United States, and Vietnam will arrive in the country to help promote free trade and "everything affecting the economic life of man," reports GMA. The leaders will be attending the APEC Economic Leaders Meeting at the Philippine International Convention Center on November 18 and 19, which have been declared special non-working holidays. MMDA will also be implementing the "Stop and Go" scheme this week. Which basically just means that when the Economic leaders pass through places like EDSA, Roxas Boulevard, Skyway, SLEX, and the roads around NAIA, traffic will stop. The week-long traffic scheme has been met with a lot of criticism, especially from Pinoy netizens who've expressed their annoyance on social media. This photo from Top Gear Philippines' Facebook page, which shows the division of the "APEC" and the "Private" lanes, has been shared more than 7,000 times. Facebook user Marvin Tomandao also voiced out his concern on social media, saying, "But this is not just a case of the Philippines putting its best foot forward. This is the Philippine Government's utter disregard of its own citizenry on 'regular days,' making them second-class citizens in their own country of citizenship. And on 'special days,' like the APEC Summit, for citizens of other countries, the government suddenly can do better, serve more, do more, give more. Hoards of spanking brand new, top-of-the-line, bullet-proof BMWs included." Despite all the negative social media feedback about the APEC week, many Pinoys still think hosting the convention is a great idea. On Top Gear's FB page, reader Bjay Aguila writes, "We may not feel any difference individually but it will help make a difference moving forward for our country. We are all suffering everyday from traffic; it just went up a notch and most likely traffic will stay the same way anyway because Christmas season right upon us. What's 3 days and two days declared as holiday pa?" What do you think of the traffic situation, CGs? Answer our poll below!